Thanksgiving is my second favorite holiday, behind my birthday month, of course! It’s an eating holiday where your biggest worry is will there be enough gravy (I like my potatoes and turkey swimming). 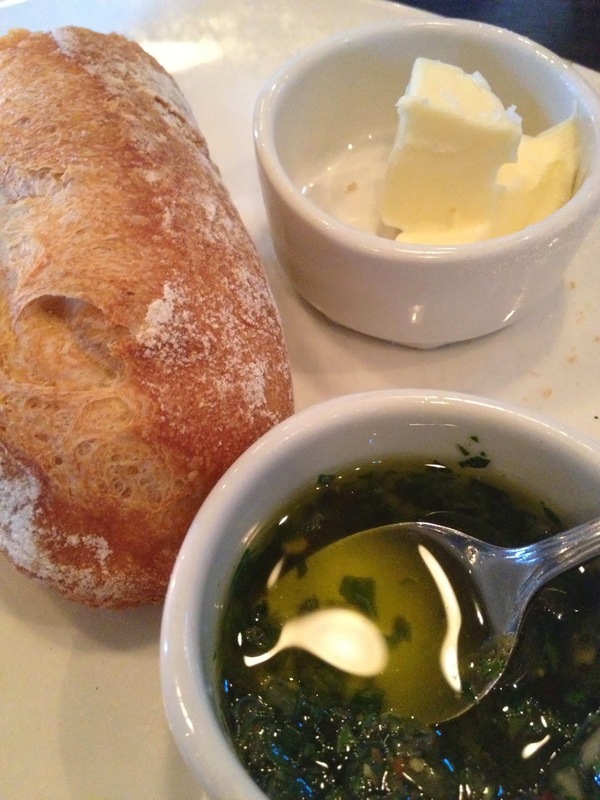 What better time to talk about a recent eating extravaganza I had in Portland? Nancy went to Portland for work for a couple of weeks last month. I decided to go down for a few days while she was down there to visit with Linda. OK, Linda lured me with the promise of letting me gather black walnuts at her dad’s place but it was the perfect time to go, I hadn’t been to Portland since March of last year. I love Portland and I love Linda, that was way too long between visits! Since Nancy and I had recently had our birthdays (well relatively recently), Linda took us out for a birthday dinner. Did I mention the fact that I loved Linda? She chose to take us to Ox, an Argentinian inspired restaurant and it also happened to be Oregonian’s Restaurant of the Year for 2013. Linda has excellent taste (in food as well as friends)! They stagger the seating for their diners and don’t accept reservations. It’s a small restaurant but they handle it well. There’s a bar next door and seating outside where people wait to get seated. The waiters were so cute that both Nancy and I thought the same thing, are we in Greece? Along with our drinks we also ordered some truffled pistachios. Many of you know I love pistachios but what I love even more is anything truffled. I’m not talking chocolate truffles. I’m talking the wonderfully umami mushroom truffle. I wish I had the super sniffer of the trained dogs or pigs so I could go on my own truffle hunt but until then, I will have to console myself with anything truffled. The truffled pistachios didn’t disappoint. Just as we were digging in, our table was ready. We had a great seat, right in front of the counter where we could watch the chefs at work, not that I did much of that, too busy looking at the food on my table. They served a complimentary amuse-bouche which always makes me happy. 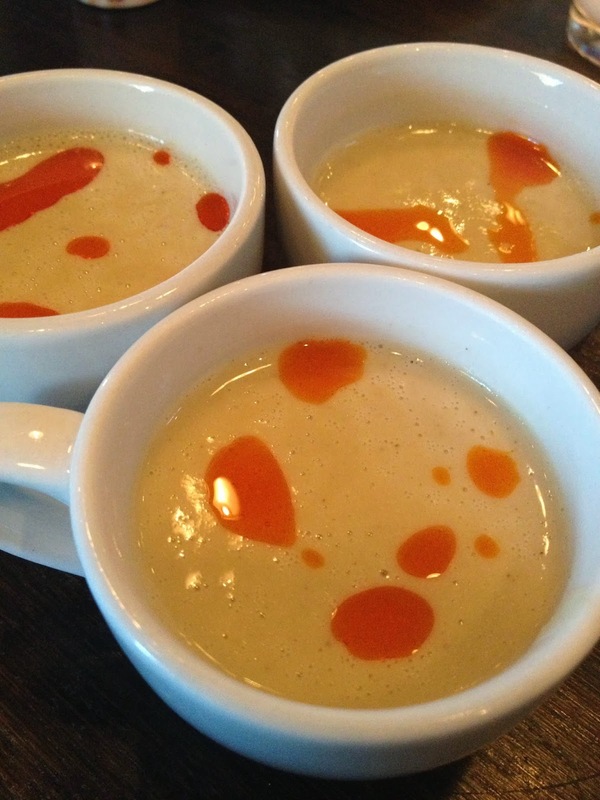 This one was a creamed cauliflower soup and it was divine. I wanted to lick the tiny little tea cup it came in. One of my favorite things about Argentinian food is chimichurri. It’s as common in Argentina as ketchup is. I love this stuff! I was first introduced to it when I lived in Los Angeles, there was this great Argentinian restaurant, Lalas, within walking distance to the last apartment I lived in (I moved a lot). I never knew what it was called until I told Linda about it and she not only told me what it was called but made some for me. Not only is it fabulous as a dip for your bread, it’s amazing on top of steak. It’s loaded with cilantro, parsley and garlic. How can you go wrong? My dear friend, Analisa, lives in Argentina. She knows of my love for chimichurri and has tried multiple times to mail me some. It never makes it to me. I had to beg her to not try anymore. I hate the waste of money. Luckily there are places like Ox where I can get my fix. The hard part is not getting full dipping my bread into this ambrosia. Looking at this picture would you guess that this was clam chowder? 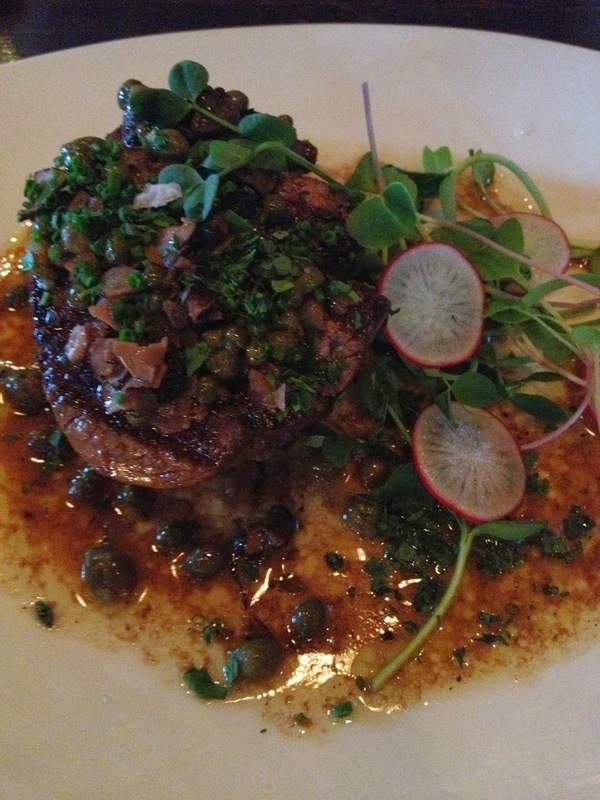 The presentation had us oohing and aahing, the taste had us drooling. 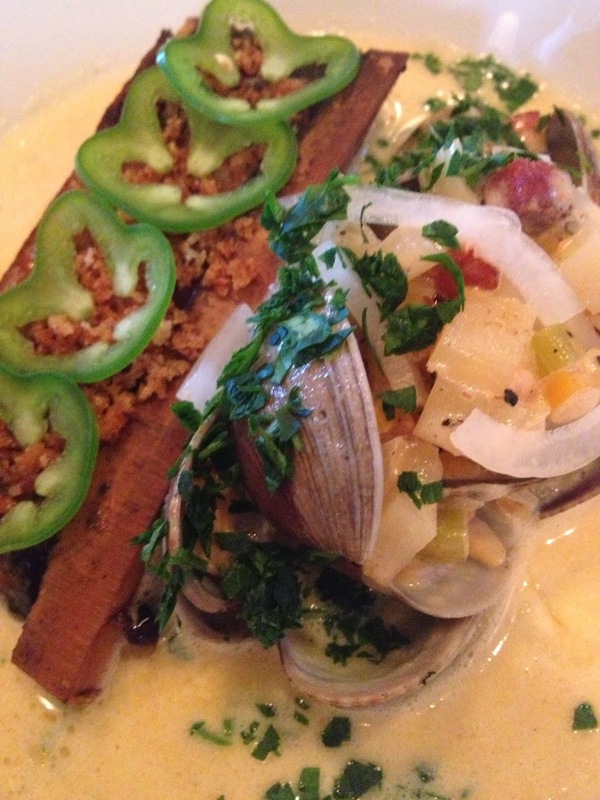 This is one of their signature dishes, a fresh clam chowder with a smoked bone marrow. Is your mouth watering? Mine was and is. The bone marrow added a depth of flavor that truffles do when added to anything. This soup was complex and delicious. Nancy only planned on eating a bite or two and she couldn’t resist eating more. One of the best clam chowders I’ve ever had (and I love me some clam chowder). 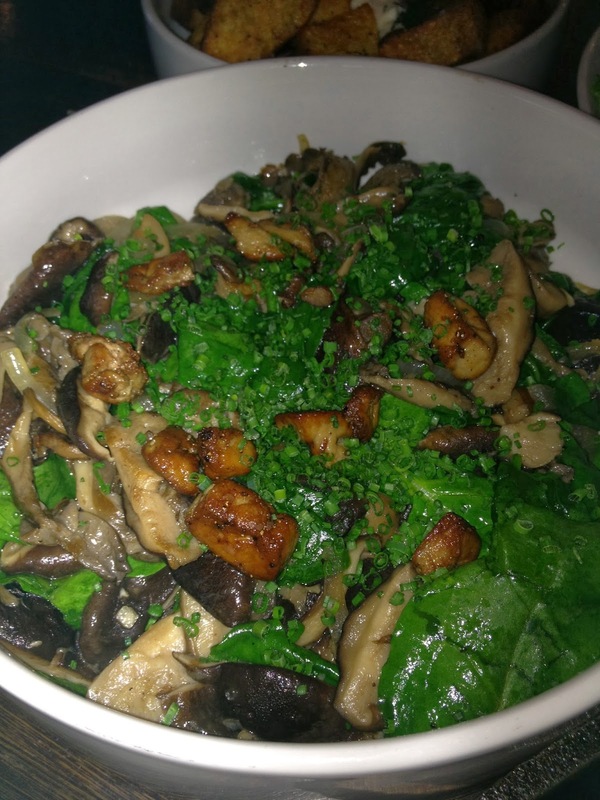 As much as I loved the clam chowder I have to say I loved the sauteed mushroom and spinach side almost as much. Why was it so good? See those delicious brown bits on top? That would be foie gras! I had forgotten that there was foie gras in this dish when they delivered it and then I took a bite and did a squeal of happiness. I really did. They didn’t skimp on the foie gras either. Color me happy! 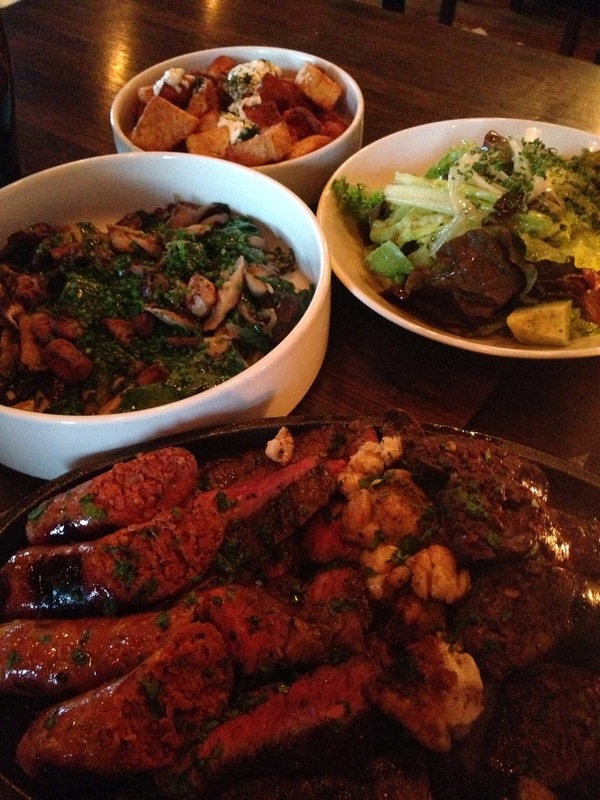 Nancy and I split the grill special for two, it came with grilled short ribs, house chorizo, morcilla sausage, skirt steak, sweat breads, fried potatoes and green salad. Sorry I don’t have a better pic of the meats. I am always a fan of the short rib, I love my meats fatty. It was nice and chewy and flavorful. Really enjoyed the chorizo. Turns out morcilla sausage is blood sausage. It wasn’t bad. I only had a bite, wanted to try it but so much other stuff that I wanted to eat that was better. The skirt steak was my fave. I’d only had sweat breads once before. I really enjoyed them here. The grill added a smokiness to this. It looked like a smoked cauliflower but with a meaty taste. I didn’t eat much of the potatoes or salad but they were good. Linda ordered a filet mignon. It was a special so it’s not always on the menu. She got the last one of the night. It’s not my favorite cut of meat but hers was incredibly tender. Her greens went perfectly with her steak. 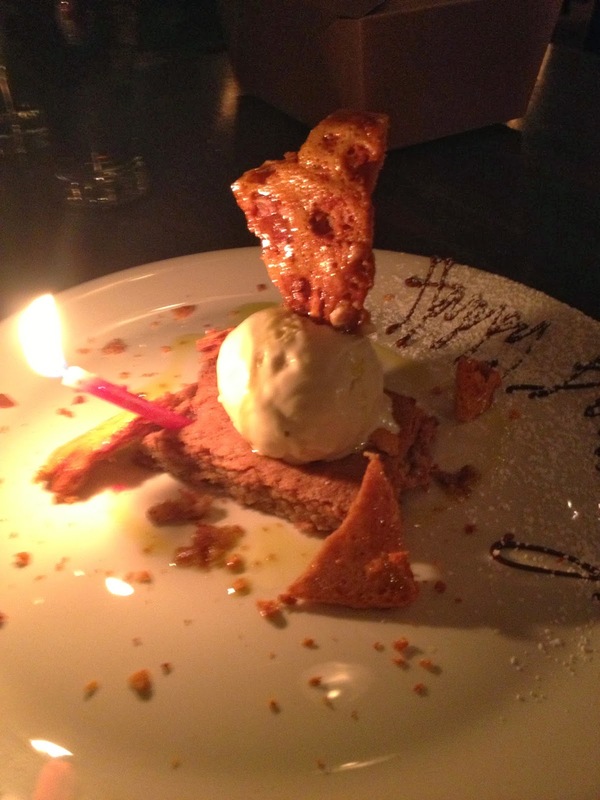 Dessert was a warm hazelnut brown butter torte, honey chamomile ice cream and honeycomb candy. I only ate a bite of it but Nancy says it was delicious and it was our waiter’s favorite dessert. I really enjoyed the honeycomb candy tho. I loved the chewiness of it. What a fantastic eating experience. Portland has some amazing restaurants and this one didn’t let me down. I would go back in a heart beat. The service was phenomenal and the food top notch. Just writing about this eating experience makes my mouth salivate and it’s been over a month. Linda has her finger on the pulse of where to go in Portland. One of the reasons I love to go there. When I try to figure out where to eat in Seattle, I never know where to go although I did have an amazing meal at Anchovies and Olives in Seattle. I’ll have to see if I can find the pics I took. I might blog on it. While in Portland Linda also took us to Sunshine Tavern which is run by chef Jenn Louis who was on the most recent edition of Top Chef Masters. She was even working while we were there so that was fun to see since I’m such a fan of the Top Chef series. Jenn Louis went home for her banh mi, which if you don’t know, if a Vietnamese sub. It was on her menu. There was no way I was going to order that. To be fair, she had the wrong bread on TC but if you’re eating at a Vietnamese restaurant or deli a banh mi runs about $2.50. The most you will pay is $5. If it costs more then that, it’s more American then Vietnamese and I won’t order it when I can get a banh mi that I love for much less. I don’t normally like to order my fries with anything on them. They get too soggy too quick but the girls wanted to try this and hey, there were 3 of us, so it would be eaten before it had a chance to get soggy. 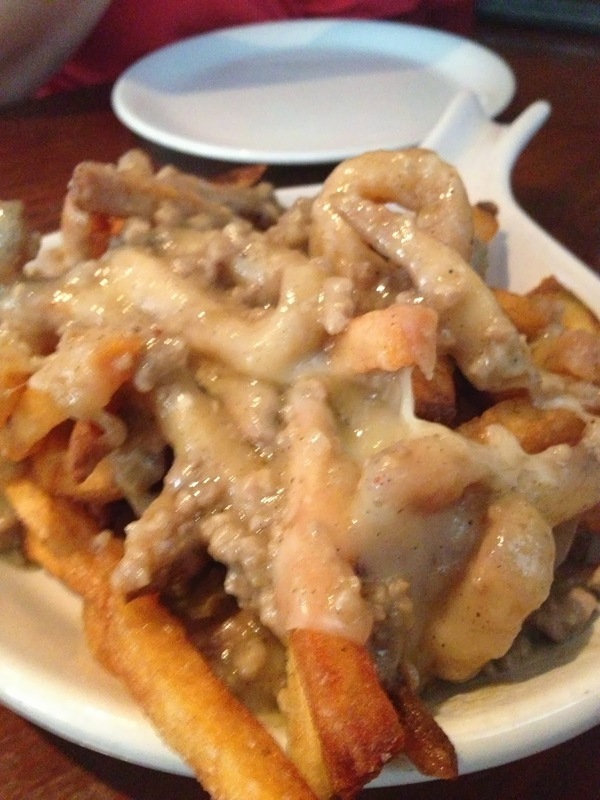 The french fries were covered in gravy and cheese but the gravy was more of a pork gravy. Yes, pork gravy. Yes, it was as good as it sounds. 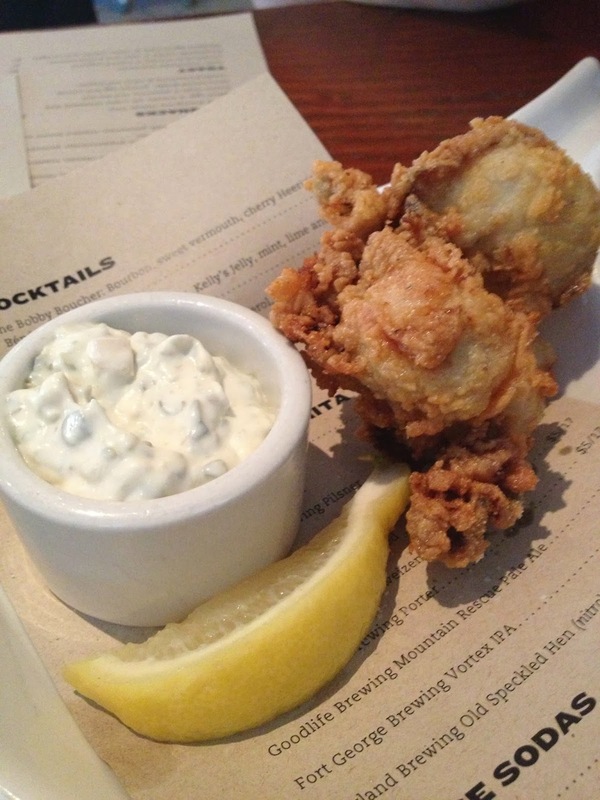 The oysters were lightly battered then fried. I really enjoyed them. Light and airy and not too big. Not as good as the ones I had at Brennan’s in New Orleans but that’s understandable. 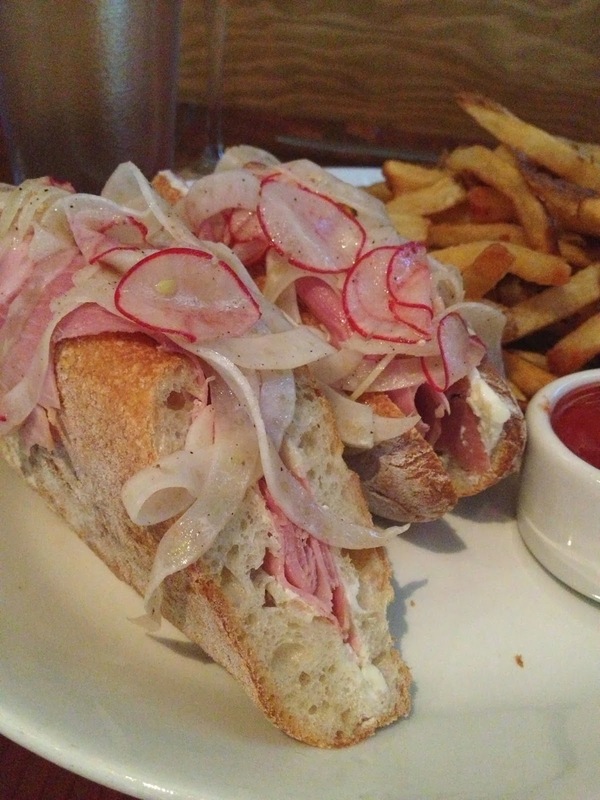 Linda ordered a sandwich that was thinly sliced ham served with butter, fennel and radish. It was actually very refreshing. Like having a salad on top of your sandwich. Since we had already ordered fries, the waiter brought Linda a spinach salad to replace her fries. How awesome was that? 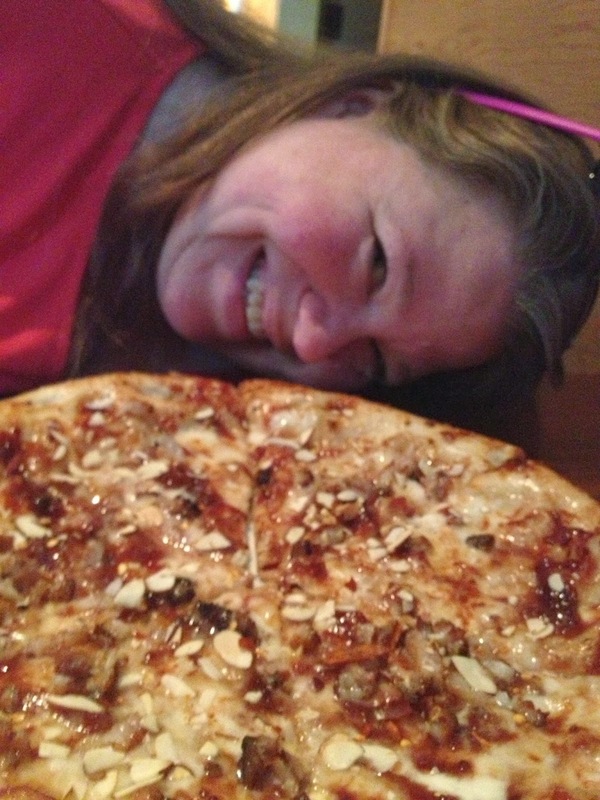 Nancy’s pizza was plum and pork belly with creme fraiche and almonds. She’s more experimental with her pizza choices then I am but her choices are always fun. This pizza was actually really good. It reminded me of a bbq chicken pizza that California Pizza Kitchen has but with pork, which is oodles better then chicken in my opinion. Unless that chicken is fried. I’m a sucker for fried chicken. 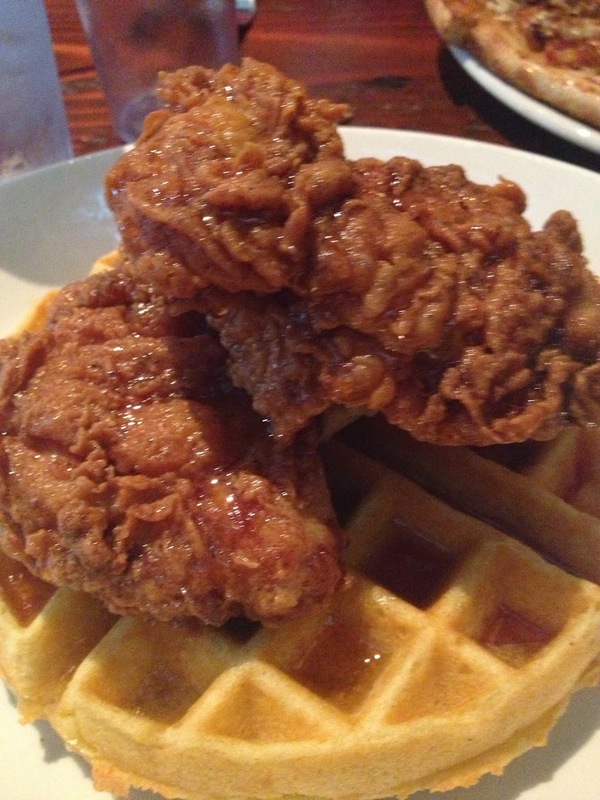 The first time I heard of fried chicken and waffles was in Los Angeles with Roscoes Chicken and Waffles. I never tried their waffles but their chicken was great. Then I moved to Atlanta and they had Gladys Knight’s chicken and waffles. Her chicken is divine and someone else ordered the waffles and they were awesome too. If you do go there, it’s well worth it to order the wings. You wait a little longer but so good! Anyway, having been around chicken and waffles for awhile, it’s not unusual to see the combo on a menu. If I could have, I would have just ordered the fried chicken but it wasn’t a chicken restaurant so I had to either order this or a chicken sandwich. I went with the waffle instead. It’s a yeasted semolina waffle with ham and clover honey. I love honey with chicken. Thanks to KFC! This chicken was served boneless so that made me a little leery. I want my chicken bone in, that’s where all the flavor is but they get raves for this dish so I tried and and I have to say, it was juicy, tender and delicious! I am a fan! The waffle did nothing for me but Linda made up for it by making me her soda waffles the next day (crispy on the outside, light and airy on the inside, my favorite!). I can’t wait for my next trip to Portland. Why did I wait so long?